Lok Sabha Elections 2019: "If we don't tell them what our views are on this, then what is the logic in that? ...Can any country move ahead without the feeling of nationalism?" Prime Minister Narendra Modi said, branding those criticising his government "hyper-secular". Nationalism and the sacrifice of soldiers are as much an election issue as the death of farmers, Prime Minister Narendra Modi said Monday, rejecting opposition criticism that he was using the defence forces in his campaign speeches for influencing voters. "In a country where thousands of its soldiers have been martyred, shouldn't that be an election issue? If farmers die, then it is an election issue, but when soldiers die then it is not an election issue? How can that be?" PM Modi said in an interview to national broadcaster Doordarshan. "If we don't tell them what our views are on this, then what is the logic in that? ...Can any country move ahead without the feeling of nationalism?" the Prime Minister said, branding those criticising his government "hyper-secular". 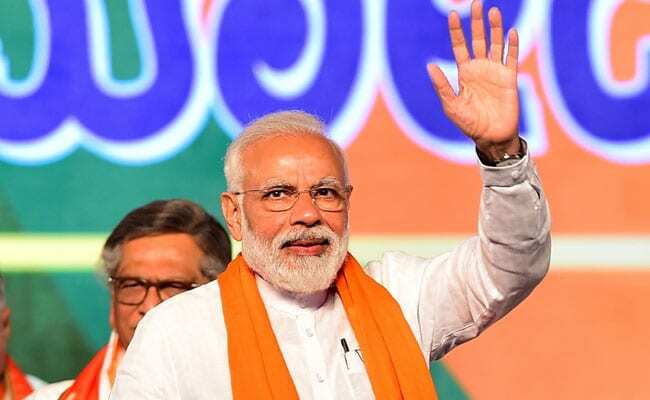 Last week, PM Modi campaigned for the BJP and asked first-time voters to "dedicate their votes" to the Indian Air Force pilots who carried out the air strike on a terrorist camp in Pakistan's Balakot and the security personnel killed in the terror attack in Jammu and Kashmir's Pulwama in February. The comments triggered a furore with opposition parties accusing the prime minister of using the defence forces for influencing voters. The Election Commission took notice and the remarks are currently under examination. The poll authorities in Maharashtra's Latur, where he made the speech, have told the Election Commission that the comments seemingly violate its orders and asked parties against using the armed forces in their campaigns. PM Modi in his interview also took a swipe at Congress president Rahul Gandhi, alleging that he was raising the Rafale issue to "wash the sins of his father", former Prime Minister Rajiv Gandhi, who faced investigations for the Bofors scandal. "He has made the Rafale issue to wash the sins of his father. For the past six months, he has been making it an issue without any proof," the Prime Minister said. PM Modi further said that in the past five years his government has addressed the basic requirements of the people that should have been fulfilled within the first 10 to 20 years of Independence. He said that his comments against the Gandhi family were against dynastic politics and his opposition was issue-based and not personal. "Dynastic politics is the most dangerous thing for a democracy," he said. Commenting on the Congress's minimum income promise Nyuntam Aay Yojana or NYAY, PM Modi said with the announcement of the scheme, the Congress has accepted that they have done "great injustice" to the people for the past 60 years. "Will they give nyay (justice)?," he asked, referring to the 1984 anti-Sikh riots. Talking about BJP's chances in the ongoing elections, PM Modi said there is an "unprecedented wave of support" for his party. "I have not seen this even in 2014," he said.